In a record-shattering show of support, singer Taylor Swift has made a donation of $113,000 to Tennessee Equality Project. 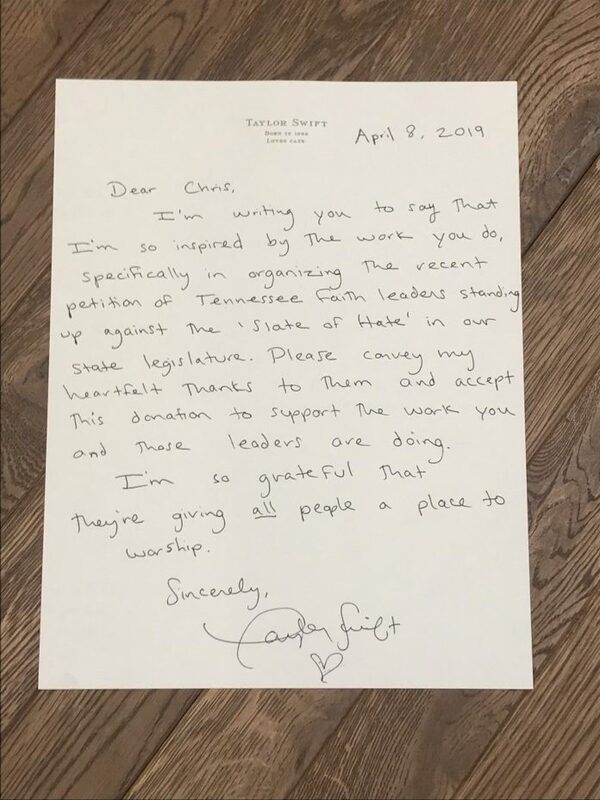 In a startling and pleasantly surprising move on Monday, April 8th, Taylor Swift sent a letter to Chris Sanders, Executive Director of Tennessee Equality Project, along with a donation of $113,000. Swift, a Tennessee native, has been a long-time supporter of LGBTQ and progressive movements, especially in her home state. In the handwritten letter, Swift praises the work that TEP and other leaders are doing to change the political landscape of Tennessee, and expresses her concern for the “Slate of Hate” legislations that have recently been passing through state congress. For more information about the work that Tennessee Equality Project does for LGBTQ folks in the state of Tennessee and on the national stage, visit their website or their Facebook page. You can also watch this space as OUTMemphis regularly posts “Dispatch from TEP” concerning legislation that affect LGBTQ Community members. If you would like to donate to their organization, you can do so here. Another donor, Curb Records, has MATCHED Taylor Swift’s donation, gifting TEP with another $113,000. See the statement HERE.